Hit the BUTTON below to read about Movies featuring Ballet in the En Pointe Blogathon! ​The Red Shoes is a fairytale story, wrapped in a fairytale movie, beautifully captured in deep and arresting colors (but more about that in a moment). 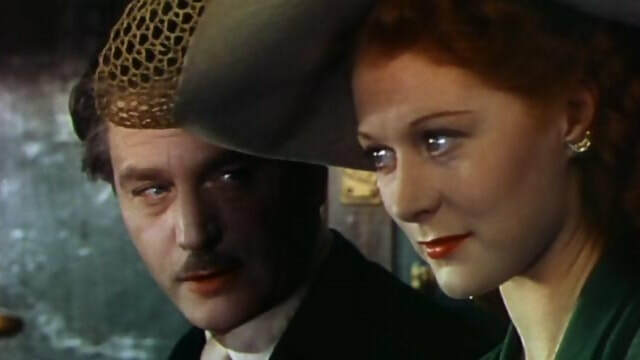 Michael Powell & Emeric Pressburger, known by their company name as The Archers, together created this splendid movie for the Arthur Rank Company in England in 1948. After recent success with Black Narcissus (1947) & A Matter of Life & Death (1943), both men wanted to produce a ballet story that had been gestating with Pressburger since the 1930’s. 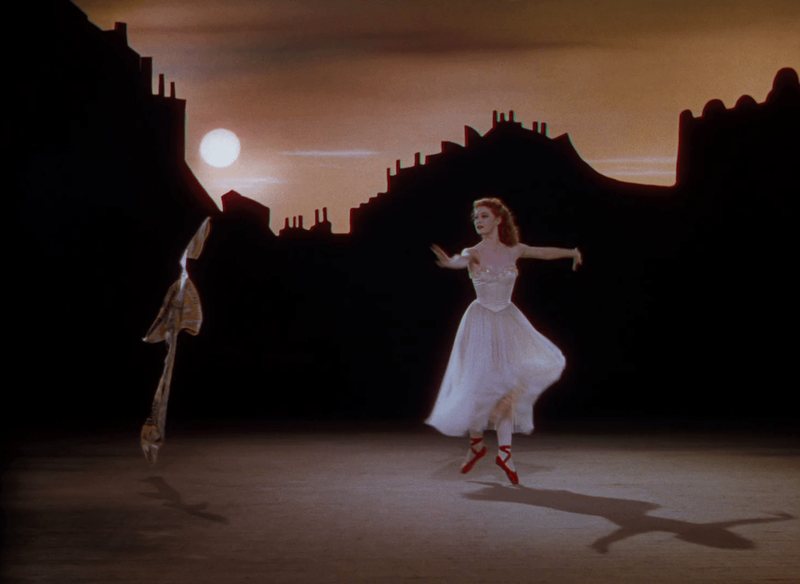 While most post-war British movies relied on documentary style realism, Powell & Pressburger had been moving towards fantasy and dreamlike imagery for several years and The Red Shoes would be the culmination of their efforts. Unfortunately, Rank was not pleased with the film and gave it nothing more than an underwhelming release in a second rate theatre in London, with none of the pomp & circumstance of the typical Archers release. Critics, however, were slightly more forgiving & while most of the reviews were mixed they were all able to draw praise for one thing or another from the film. British fans were more forgiving, however, with Daily Mail readers voting The Red Shoes the #3 movie for 1948 (behind Spring in Park Lane & Oliver Twist). It wasn’t until it released in the United States later in the same year that it began to garner critical and audience praise, playing mostly in larger cities at arthouse theatres. 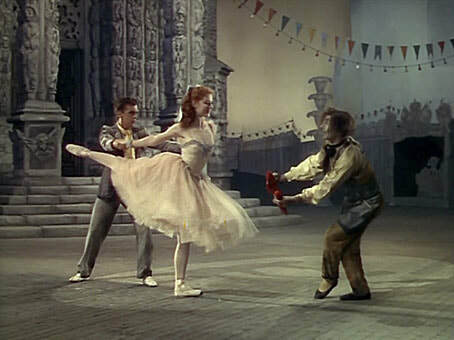 The basic theme of The Red Shoes is captured in Lermontov’s & Vicky’s first conversation when he asks her “Why do you want to dance?” and she answers “Why do you want to live?” Powell & Pressburger immediately moved beyond the idea that art/movies should merely reflect life; for them art/movies is life. After the deprivation and suffering of British people during WWII this was a radical departure from the norm, but it struck a chord with viewers then as it still does today. Later, when Craster boldly approaches Lermontov about having pieces of his score stolen by a colleague, Lermontov responds that “it must be more disheartening to have to steal than to be stolen from”, echoing the theme of art for art’s sake and to merely create is reward enough. Under the control of Lermontov both Vicky & Craster must succumb to this belief of suffer the fate of opposition. Powell repeatedly reinforces this theme in both images and scenes, often captured without dialogue and emphasized through music. The structure of The Red Shoes starts as most backstage musicals made in the 1930’s (42nd Street, Gold Diggers of 1933, Footlight Parade) did, with the challenge of putting on a new show and the intrigue therein. Where the Archers diverge from the traditional musical narrative elevates The Red Shoes because they put the climax in the middle of the film, when Vicky dances the Red Shoes Ballet. By creating a wordless 15 minute ballet sequence as a movie’s centerpiece The Archers create a third act where the aftermath of the climax is played out for more than an hour. Vicky’s triumph throws her soul into chaos as she must choose between the thing she loves and the person she loves. As she told Lermontov, she’d just as soon breathe as dance. ​The dance itself is an amazing blend of fantasy and emotion, color and movement that sets itself apart from the movie, but blends itself into the whole of the structure. It begins just as it ends, with the evil shoemaker showing the beautiful red shoes to the audience, tempting them to try the shoes, just as he tempts the dancers. The shoes, however, are only for a particular dancer, one with the grace & beauty, put more importantly a desire and drive to dance ever onward. Vicky is that dancer in the eyes of the shoemaker, just as she is for Lermontov, who becomes one with the shoemaker in a visual effect later in the dance. As the shoemaker tempts her, even allowing her to imagine her reflection in his store window, the shoes become her focus until they magically attach themselves to her feet. Lermontov’s last words to Vicki before she goes onstage “the music is all that matters” ring true as the shoes take over Vicky’s life, as evidenced by her dance partner/boyfriend backs away from her as the shoes take over. 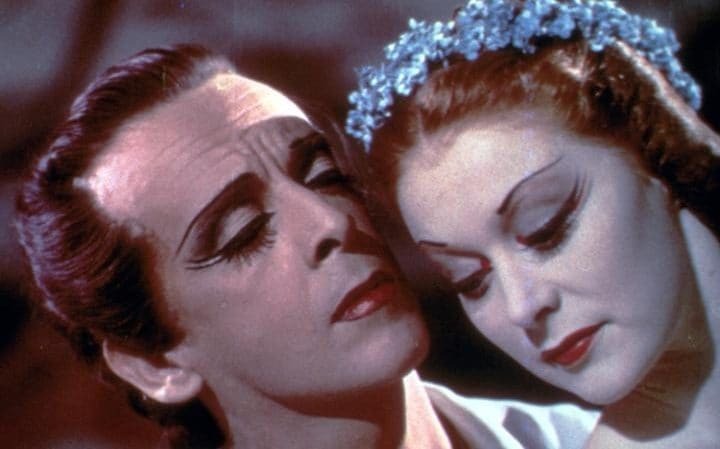 The Red Shoes dance was beautifully choreographed by Robert Helpmann, who plays her principal partner, beginning as it does as a dance for the theatre audience, then morphing to a dance for the cinematic audience through Powell & cinematographer Jack Cardiff’s magic. The shift into the realm of fantasy is abrupt and signals the departure of the shoes brining happiness and into the more sinister world of the shoemaker. While the midway is pleasant and colorful, the images of Vicky/the girl flitting from man to man signals the demise of the innocent and fore shadows her descent into depravation later in the dance. As the shoemakers hands claw at the girl in shadow, pulling her away from her mother, then her boyfriend she slips further & further into the fantastic realm of the shoes power. The colors on the screen change from the warm golds, yellows & blues of the midway to the deep reds of the shoemaker’s world. The dance with the newspaper, covered in her image, is the last semblance of the real world, but even it is make believe, as she finally slips towards desperation. The final scene, played out in grays & blacks, of the funeral procession, rejection by her now celibate boyfriend/priest and death brings her back to reality, but her dress is in tatters & all she wants is to hack to shoes off her feet. Even this, however, is controlled by the shoemaker, who has the last word as she dies in the priests arms, redeemed and forgiven, but only granted peace when the shoes are removed. Finally, it is the images created by the Archers & most notably Cardiff that sets The Red Shoes apart from anything before it or since. Red, being the primary color theme throughout, from Shearer’s hair, to the shoes and the entire mis en scene, helps drive the idea of passion, desperation and finally despair. Art for art sake is not enough; it is art as life that matters to the overall meaning of this film. The red shoes themselves are only the vehicle to illustrate that beauty, while fleeting, can also create greatness, but in the end it is only the art lives on forever, just as the shoes are taken by the shoemaker to be shared again and again. *The Archers produced 14 films in 13 years as partners. *The Archers bought back Pressburger’s script from Alexander Korda for 18,000 pounds. They would later go on to make films with Korda after a falling out over The Red Shoes with Arthur Rank. *Powell & Pressburger long sought to create a “composed film” that would perfectly marry the image on the screen to the music on the soundtrack. There are several non-dance sequences in The Red Shoes where is idea is experimented. The Tales of Hoffman (’51) is perhaps the best example of this idea. *Shearer’s on again off again decision to play Vicki led to Powell/Pressburger to consider many non-dancer actresses, but in the end they couldn’t imagine the movie using a double to dance the Red Shoes dance. *The Film Act of 1948 in Britain raised the screen quota on British made films from 20% to 40% which created both a boon to production, but also a stress on British film companies. The Hollywood studios retaliated by not allowing a British import into America to be billed alongside an American movie, thus pushing them to second run theatres or off screen altogether, limiting their box office potential significantly. *Martin Scorsese had a close relationship with Michael Powell & helped create a revival & reassessment of his work in the 1970’s. Scorsese credits Powell as one of the greatest influences on his own work. Thelma Schoonmaker, Powells 3rd wife, has edited every Scorsese film since Raging Bull, winning 3 Academy Awards in the process. *Directors Brian DePlama (Scarface, Untouchables) & Francis Ford Coppola (Godfather I & 2, The Conversation) also credit The Red Shoes & The Archers in particular as major influences on them becoming film makers.